There is, however, one notable exception: Austria. Since December 2017, this small but influential European nation has been led by Sebastian Kurz, a dynamic 32-year-old Catholic politician who has taken Austria (and Europe) by storm. Before Kurz, Austria was much like the rest of Europe. The nation was divided over the issues of immigration, Islam and the European Union. The people were disenchanted with the mainstream parties; the popularity of the far-right party, the Freedom Party of Austria, was surging. Then Sebastian Kurz came along. Today, “the far right and the mainstream have merged” in Austria, Time stated in November. Austria’s new chancellor has somehow united the mainstream and the far right on “the issues that trouble Europe the most, namely identity, Islam and immigration.” Today, Kurz is more popular than ever, and Austria is much more stable and content. What’s his secret? For aspiring leaders in Europe, the Kurz experiment in Austria furnishes some important lessons. Lesson 2: Avoid being perceived as elitist or an establishment politician. A major part of Sebastian Kurz’s appeal is the fact that he is not a typical politician. He also doesn’t look or sound like a bureaucrat. He might lead the establishment, but he isn’t perceived to be a part of it. In today’s political climate, voters worldwide want renegades, leaders who aren’t afraid to shake the system and tackle the issues. Kurz doesn’t shy away from discussing sensitive subjects. He doesn’t obfuscate and lie. Or at least he doesn’t appear to obfuscate and lie. He appears to speak the truth—candidly, without apology and in terms that are politically incorrect. In 2016, not long after he closed Austria’s border to migrants, he said: “Those who do not put clear limits on migration will soon start to feel like strangers in their own land.” You will never hear Angela Merkel or Emmanuel Macron make remarks like that. Sebastian Kurz did, and most Austrians loved that he did. Lesson 3: Address populist issues, but don’t be populist. Kurz isn’t afraid to tackle sensitive issues like migration, Islam and the EU. Yet on all these issues, his views are pretty nuanced. He doesn’t want to toss all Muslims out of Austria. Rather, he wants to manage their inflow and influence in an effort to preserve Austrian culture. Many consider this approach rational, thoughtful and measured. Kurz is strong, but not tyrannical; unbureaucratic, but not unstructured; anti-establishment, but not anti-government; nationalist, but not uncompassionate. By addressing the populist issues, but not behaving as a populist, Kurz has established himself as the alternative to the far right. Lesson 4: First address the heart, then the brain. In presenting his views, Kurz “boiled down his platform to a few often-repeated bullet points—anti-migration, anti-politicized Islam, pro-personal responsibility in the economic sphere—without too much policy detail,” wrote Foreign Policy. He avoids bureaucratic language. He addresses the issues, and the fears and anxieties, of the people. Lesson 5: Appeal to nationalist sentiments. Deutsche Welle said it succinctly: Sebastian Kurz wants to “make Austria great again.” In March 2014, after the government added the department of integration to his Foreign Ministry, Kurz initiated the so-called “Stolz-Kampagne,” which translates literally to “Proud Campaign.” Through the campaign, Kurz encouraged immigrants in Austria to share on social media and other platforms the things that make them proud to be in Austria. Lesson 6: Embrace the vision of a united Europe. Despite all of his populist views, Kurz is actually very pro-EU. He doesn’t want the EU disbanded; he wants it reconstituted. Kurz doesn’t talk incessantly about overthrowing the system, like Viktor Orbán and others. He is much more nuanced in his criticisms. In Brussels, Kurz is admired and respected by European leaders. Kurz is one of the rare politicians in Europe who enjoys the support and respect of both the people of Austria (and Europe) and Europe’s elites and politicians. Thanks to this unique position, he has emerged as a mediator in a nation with a history of mediating east and west. Indeed, this is how he sees himself. “Austria is a country that can function in Europe as a bridgehead between Eastern and Western Europe,” he said in 2017. His Catholic faith also influences his politics. The Catholic Herald has reported that Kurz surrounds himself with a team of practicing Christians and that he meets regularly with Catholic authorities. On election day, he told reporters that he had visited the “Sunday mass in my baptistery in Gatterhölzl,” where he prayed. That same day he tweeted about his visit with Christoph Schönborn, the archbishop of Vienna and a potential successor to Pope Francis. As foreign minister, Kurz was known to have sought the counsel of a Catholic priest on how to deal with the migrant crisis. The actions he took after that meeting actually stopped the influx of migrants into Germany and Eastern Europe. In December, Austria concluded its six-month tenure as president of the Council of the European Union. As council president, Austria—and specifically its chancellor, Sebastian Kurz—had the opportunity to promote specific causes throughout the EU. Kurz used the occasion to highlight Austria’s cultural and imperial heritage, and he focused in particular on the Holy Roman Empire. Has Sebastian Kurz supplied the blueprint for Europe’s salvation? Time will tell, but the fruits of his leadership are obvious. The sense of crisis that hung over the nation before his arrival has subsided. Austria’s populist uprising has calmed. The migration issue remains but is under control. The nation’s economy is stable. Austria, politically and socially, is relatively content. In other words, Austria stands in stark contrast to virtually every other nation in Europe—and it’s thanks primarily to Sebastian Kurz. 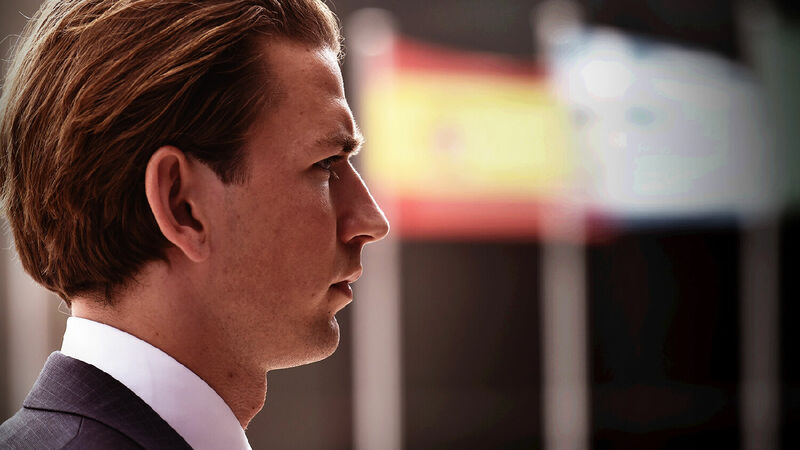 If you haven’t read it already, I encourage you to read “The Prophesied Holy Roman Empire Has Arrived.” This article by Trumpet editor in chief Gerald Flurry puts the rise of Sebastian Kurz in its full prophetic context.